Crystal Blanton takes on one of the toughest aspects of modern paganism: getting Pagans to work together harmoniously. While churches, activist organizations and even publications experience these same challenges, often these groups can weather storms perhaps with greater longevity than a coven or pagan group: the commonality is greater, the cultural support for continuity spreads wider, and the people involved have more alternatives available to them in terms of community resources. While more Pagans develop the much-needed skills for leadership of unusual people outside the paganosphere and bring it with them, most people offer one or two needed skills for strong leadership and organization, but few possess all of them. In a day where the principles of Dreaming the Dark can only apply to specific Pagan religious traditions, Blanton’s generalist call for tolerance, etiquette and active knowledge about social behavior demands that everyone update their perspectives on Pagan social dynamics. 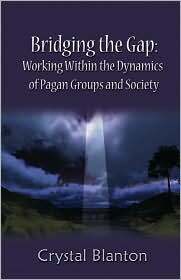 Bridging the Gap offers a series of “best leadership practices” not often used in the Pagan community. From identifying group politics and the exact way in which those politics spin out of control, Blanton identifies exactly what a Pagan organization leader needs to know in order to run a group successfully.